Quvenzhané. A small force of nature. She is the small, determined center of Benh Zeitlin's "Beasts of the Southern Wild," which opens July 6 and seems destined for a Best Picture nomination from the Academy. 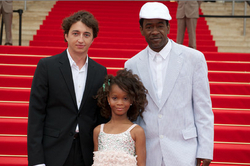 Quvenzhané Wallis was six when she filmed the role. She and all of the other actors were non-professionals. Incredible. I interviewed Quvenzhané, her co-star Dwight Henry and her director Benh Zeitlin during their Chicago visit. This video was edited by Paul Meekin. My print interview with Quvenzhané follows. "As an actress," I asked Quvenzhané, "what was the hardest thing for you to do?" "Doing all the lines because they are very hard and you have to remember all the lines --and sometimes they have long lines, so you've just gotta keep catching up." 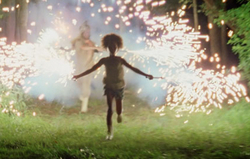 "How much of Hushpuppy is made up, and how much of her is like you?" "She has animals and she likes to explore the world and have adventures that she can always complete. But she's not really me because she doesn't wear her pants pretty much and she has more animals, likes to explore more and she can complete it anytime she wants to." It comes out in a rush of enthusiasm. She's sitting next to her mother, Qulyndreia, and across from (left and right above) Zeitlin and Dwight Henry, a New Orleans baker who plays her father, Wink. But she doesn't look to them for guidance. This isn't her first interview. "Tell me about your audition," I said. "They were looking for someone older. What do you think you did that impressed them?" "My audition turned out to be at the library and my Mom got a call from one of her friends and it was for a six to nine year old. So my Mom said I couldn't go 'cause I was only five. But we just went and we act like we're having nothin' to do; we had done nothin' wrong. And we just sneaked in because I was like one year younger so we just sneaked in and we walked out like we ain't done nothin'. "So they called back and they said they were looking for Nazie. My Mom says 'Oh, you must be looking for Quvenzhané.' They were like, no, we must have called the wrong person and they almost hung up but my Mom caught them. And she goes, 'she must have told you Nazie,' and they were like, 'yes, that's who we're looking for.' And that's Quvenzhané. And they only have found me because the character who is Hushpuppy, she does what is right and she is fearless and that's what I did at the audition." Quvenzhané is in third grade at Honduras Elementary School in Houma, LA, and has three siblings, Qunyquekya, Venjie Jr., and Vejon. "What did your family think about the movie?" "My siblings thought that it was a good thing to do and my Dad thought, 'just let her go and see if she gets the part. She's young right now so I don't know if there is a talent that she thinks she can do'." "Did anything turn out different that what you imagined while you were filming?" "Not really. Just that I missed a lot of school pretty much but it helps because they gave me a tutor so there was nothin' to worry about. " "Was it ever dangerous?" "Not really. It was all safe. All the fire things and all the fireworks, they wore safety things 'cause they have like safety fireworks..."
"You went to the Cannes Film Festival?" " Yes. It was awesome because we had a lot of standing ovations." "What was your impression of France?" She sighed. "I really didn't know that much French, so I was just like stay out of sight and wouldn't really talk that much. All I know is 'bonjour,' 'merci beaucoup' and stuff like that." 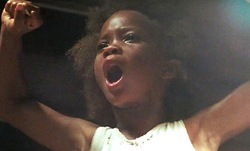 In the film, Quvenzhané has an ear-splitting scream that completely expresses her frustration at the difficult world she lives in, and after her father tells her that her mother "swam away," she screams for her mother to return. No one will ever forget the power of that scream. "I'm mostly a girl so I really do these things but I scream and that came to me and I've been doing that since I was a little girl," she said, "and I would always scream for my brother so the other team can lose. That's not very girlie but it's something that I know how to do and always did." "Did they know about that when they put you in the movie?" "No. Well, the first day, the audition, I didn't tell them at all. So when I got the audition and I first got to the set, I did it. So they didn't even know about it. Right in the middle or in the beginning or something. They didn't even know about it; they were kinda surprised."